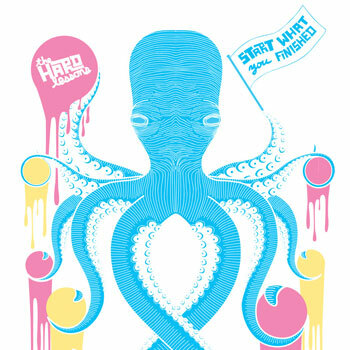 Storming onto the Detroit rock scene in 2004, the Hard Lessons breathed new life into the Detroit garage sound and eclipsed it with their own unique blend of Motown and soul and their high-energy synth- and guitar-driven style. With songs that span from loud, rousing rockers with singalong crowd chants to moody, poppy ballads worthy of a stadium full of lighters held high, their style is at once immediate and fresh while also harking back to a sound and energy that most contemporary rock acts seem to have forgotten. The group is known for its ability to amp up the energy with the audience, using a simple yet effective mix of girl/boy vocal harmonies, catchy pop/rock hooks, and foot-stomping, hand-clapping beats. The band consists of three members, fronted by guitarist/vocalist Augie “Gin” Visocchi and organist/vocalist Korin “Ko Ko Louise” Cox, who are backed up by the powerful drumming of Christophe Zajac-Denek, otherwise known as the Anvil. Founded in East Lansing, MI, in 2003 while attending Michigan State University, the group originally began as a four-piece under the name “the Boll Weevils,” but soon changed the name and scaled back to three members, with the bass player dropping out and Cox taking on bass organ duties. After crafting an explosive live set of original material, the group quickly rose to the forefront of the Lansing scene. After the members graduated from MSU, they set their sights on more gigs in the Detroit area and recording. The trio soon released the Feedback Loop 7″ single in 2004. Produced by Jim Diamond, the two tracks show the band developing its sound and cutting its teeth on songs like the B-side, “Love Gone Cold,” which showcases Cox’s strikingly soulful, sultry vocal talents. The A-side has Visocchi taking on vocal duties and blasting through a rousing rock number à la the Who. The single quickly sold out and saw the group gaining a large local following as well as more high-profile shows with groups like the Dirtbombs, the Paybacks, the Von Bondies, and the Sights. As their tour schedule and popularity increased, the band ditched their day jobs and devoted all their time to recording and performing. 2005 saw the band release their debut album on No Fun Records. It was titled Gasoline, an apt title given their incendiary live performances. Due to the band’s non-stop touring schedule, the record took six months to record, in three different recording studios, yet was able to deliver all the promise from the high-energy live shows. Produced by Zach Ships (Electric Six), the album shows a heavy Motown/garage rock influence, but also finds the group branching out into other genres such as indie pop, blues, and country. Tracks like “Milk and Sugar” sound more like pop/rock than garage rock, strongly relying on the synth, bass, and drums to drive the song, with Visocchi turning in a passionate vocal performance at one point, singing through his guitar pickup. “That Other Girl,” sung by Ko Ko Louise, has a slight country feel while still maintaining the rock vibe. The Anvil drives the record from start to finish with his unrelenting pounding attack on the drums. Gasoline was heralded by the local press and fans alike and established the band as one of the must-see acts in the area.